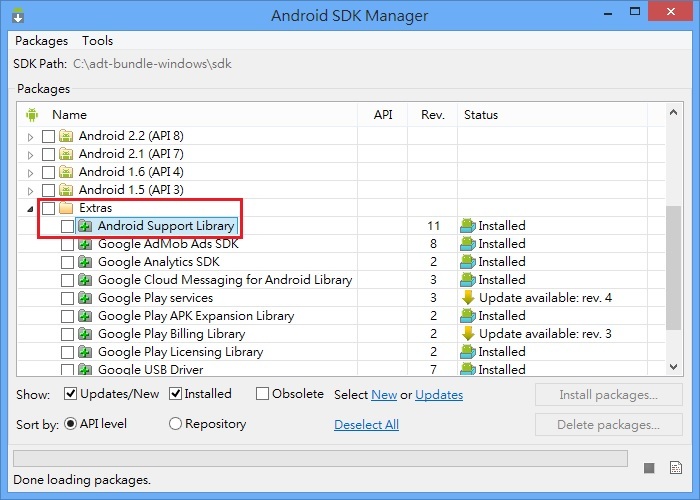 The Android Support Library is offered as an SDK extra component that can be installed from the Android SDK Manager and located at the path sdk\extras, say C:\adt-bundle-windows\sdk\extras. It contains static libraries providing access to newer APIs on older platforms and various helper classes. Each library is called v<api>, indicating the minimum API level that they require. – CursorAdapter / ResourceCursorAdapter / SimpleCursorAdapter. These are the API 11 versions. – MenuCompat allows calling MenuItem.setShowAsAction which only exists on API 11.
v4/samples/ provides a sample app using the library. – FragmentPagerAdapter: Implementation of PagerAdapter that represents each page as a Fragment. v13/samples/ provides a sample app using the library.